Schwarzenegger | WHAT A FEELING! After muscleman Arnold Schwarzenegger’s initial forays into the cinema—namely, Pumping Iron and Stay Hungry, in which he basically played himself—people wondered just how this awesomely constructed fellow with the thick German accent would ever find his niche in films. Well, perhaps not that many people wondered. In fact, Schwarzenegger was not taken seriously at all—although the Hollywood folk who laughed at him way back when may be kicking themselves now. Schwarzenegger seems to know what he’s capable of, and he knows how to package himself (if you’ve ever seen him on talk shows, you know he’s not stupid). He’s been bankable since the first Conan movie, but his real success may lie not with that centuries-old character but with a very hip, modern kind of action hero. 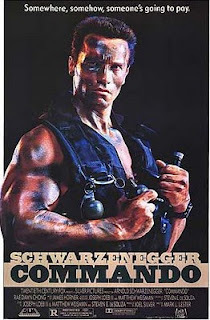 In last year’s The Terminator and the current Commando Schwarzenegger is playing almost the same role, with just a few technical differences (the Terminator was not human; the Commando is, so we’re told). The two films share a sardonic sense of humor that approaches nihilism: Arnold cracks jokes as he walks away from the bad guys he’s just blown away. In Commando, that’s quite a sizable number of corpses. Arnold mows down more enemies than you can shake a stick at, all the while catching a few scratches on his own considerable torso. He’s mad because the bad guys (led by Dan Hedaya) have kidnapped his daughter to blackmail him into performing a Third World assassination. Arnold escapes their clutches by dropping out of the bottom of a plane just as it’s taking off (this may be a movie first). He then has to find the villains within a few hours, and the trail leads him to a ritzy Los Angeles shopping mall (great shootout), a sleazy motel room, and finally a secluded island fortress where Arnold paints his body and wipes out the final couple hundred adversaries. 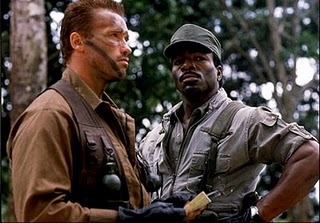 His last confrontation is with an old Army buddy who was drummed out of Arnold’s fighting unit. He’s played by Vernon Wells, who displayed formidable fearsomeness as the mad, Mohawked Wez in The Road Warrior. He still makes a good emissary of evil. Commando is certainly nothing great—not even on a pulpy level, as The Terminator, a lively movie, was—but it does have a sense of humor about itself. Schwarzenegger is not quite as believable as a human being as he was as an android, and they’ve given him too many lines of dialogue. To the film’s credit, there is a rather nice love interest for the big guy in the figure of Rae Dawn Chong, as a stewardess accidentally drawn into Arnold’s chase. Much of the time she’s crouching behind tables, shrieking as Schwarzenegger dukes it out with someone, but she also gets to hang around and get off some one-liners. When Arnold is mixing it up with a particularly nasty opponent, Chong makes the pointed aside, “These guys eat too much red meat.” The people who cooked up Commando share those dining habits. Still early in the Schwarzenegger breakthrough—early enough so that he’s working with directors like Mark Lester. I recall this one having far too many awkward lines—you just want him to shut up and be Arnold. Red Sonja, a medieval semi-epic, may be the first example of a sequel without a predecessor. As the film begins, we see the title character (played by model Brigitte Nielsen) waking up among the ruins of her home. Something big has happened, though we don’t know what. A ghost appears and tells Sonja to avenge the carnage here—a convenient expositional device to let the audience know how all this happened. The ghost says that Sonja’s family was killed by an evil queen (Sandahl Bergman of Conan the Barbarian) and that Sonja must avenge the deaths and retrieve this big glowing green ball, which contains the power to destroy the whole world. Sonja fulfills this revenge, naturally, which constitutes the rest of the film. So, basically, the filmmakers have saved themselves the trouble of shooting the whole first half of the story by summarizing it in this introduction. You’ve got to give them credit for being smart; unfortunately, this leaves the film a bit shy of motivation and meaning. We don’t care too much about what happens here—we just know who’s good and who’s evil. 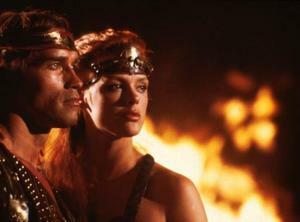 Included in the good is Arnold Schwarzenegger, as a warrior who helps Sonja along her sword-swinging way. Since the film is basically a showcase for the long, lanky physique of Nielsen, Arnold is to be forgiven for looking a bit miffed during the action. Just when he’s riding hotter than ever (on the strength of last year’s hit The Terminator), he gets saddled with a smaller role. Sonja and Arnold attack the castle of the evil queen with the dubious help of an obnoxious child king and his obedient slave (Paul Smith). They’re the comedy relief, such as it is. Even though Red Sonja is only half a movie (at barely 90 minutes), there’s little evidence it would have been any better longer. Veteran director Richard Fleischer, whose career has ranged from interesting small films (The Narrow Margin, 10 Rillington Place) to sprawling epics (The Vikings, Conan the Destroyer), clearly hasn’t got his heart in the proceedings. He manages only one good sequence—a nifty fight with a mechanical monster, in an underground cave in which the water keeps rising—and the rest is perfunctory. Even the pretty photography of Giuseppe Rotunno doesn’t help. Mogul Dino di Laurentiis, who also executive-produced the Conan films, brought these folks together after having spotted Nielsen in a magazine ad. She’s moved on to a co-starring role in Rocky IV, alongside Sylvester Stallone (a role she inhabits in real life, too). About the only element of interest here, for those who wish to bother about it, is the women’s lib subtext. These kingdoms—or queendoms—are ruled by women who wield their swords and decapitate men. Sonja herself has an aversion to men, which blocks Arnold’s hopes for hanky-panky until he can “conquer her,” or vice versa. It’s all a little weird. A decade from now, someone may evaluate Red Sonja in Freudian terms and proclaim it a rediscovered masterpiece. Until then, give it a wide berth. This weekend brings the new Conan the Barbarian, so here’s a shard from that world. Can’t find my Conan the Destroyer review, but I remember it as being pretty lame—I like Fleischer as a director, and along with his top-line stuff he did nice work on lesser material, but I can’t recall anything really noteworthy about these two pictures. After weeks of coming attractions, magazine teasers, TV commercials, and honest-to-goodness billboards, the movie seems a bit redundant. Yes, Twins is here at last, the film that dares to suggest a fraternal kinship between Arnold Schwarzenegger and Danny DeVito. 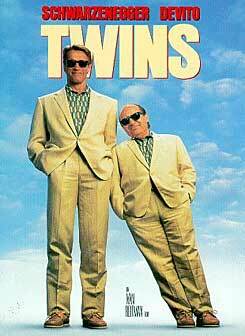 The joke of the movie is basically that these two preposterous actors could possibly be brothers. Twins, yet. There have been worse excuses for movies, to be sure, and Twins plays out its concept at a reasonable level of good-natured fun. That’s how baby Julius, Schwarzenegger, was taken to a remote island and raised in isolation by an egghead professor. Baby Vincent, DeVito, was dumped in an L.A. orphanage and left to fend for himself. When Julius learns he has a twin, he leaves the island and ventures out into the world for the first time. The middle section of the film works the best, when the brothers take a road trip to New Mexico with girlfriends (Kelly Preston and Chloe Webb), and actually learn to like each other. The mob plot keeps intruding; it wears the movie down a bit, and also overextends it. Producer-director Ivan Reitman organizes things in his usual slipshod fashion, but he seems to have a knack for knowing what people want (he directed the megahits Stripes and Ghostbusters). Reitman gets DeVito to do his rolling sleazeball routine, which is generally on-target. Schwarzenegger tackles his first (intentional) comedic performance with good cheer, though he might have been funnier if no one had told him to play this as comedy. 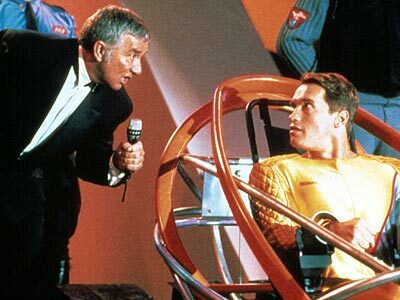 Arnold and Ivan Reitman would make two more comedies, Kindergarten Cop and Junior; the latter, I really don’t need to tell you, is the choice for aficionados of the collaboration. The success of this film must also be held accountable for Sylvester Stallone’s forays into comedy, which did not work out as profitably as Schwarzenegger’s. I sound somewhat bored in this review, and I can’t blame me. There’s some hard, mean fun to be had in The Running Man, the new Arnold Schwarzenegger film, in which he plays yet another version of the monosyllabic man. Much of the fun, no doubt, comes directly from the novel by Richard Bachman, a pseudonym for the appallingly prolific Stephen King. The book and film propose a futuristic game show in which the contestants are criminals who are hunted down and killed by professional stalkers. And it all happens live, in living color, on nationwide television. The most dangerous game indeed. The show doesn’t merely generate rating points, it also pacifies the population, which suits the shadowy totalitarian government just fine. They supply the criminals, the cartoonish stalkers provide the bloodshed. Schwarzenegger stumbles into all this when he’s falsely convicted of mass murder. Now known as the “Butcher of Bakersfield,” he’s delivered into the diabolical hands of the creator-host of the “Running Man” show (played by former “Family Feud” host Richard Dawson with all the evil unctuousness he can muster, which is a lot). So, of course, the better part of the movie is taken up with Arnold’s battles against the stalkers, who have names such as Fireball, Buzzsaw and Dynamo. As expected, this makes for some punchy action sequences set in a war-zone vision of Los Angeles. But the film’s at its best in the realm of nightmare fantasy. We see commercials for shows such as “Climbing for Dollars,” in which contestants must scrap for cash in a room full of bloodthirsty Dobermans. And any time Dawson is holding forth to his rabid studio audience, the movie really falls into its black-humored groove. Directing is Paul Michael Glaser, who used to be Starsky in “Starsky and Hutch,” and thus knows something about violence and television. Glaser herds all the action effectively, but someday some director is going to have to work up the nerve to tell Arnold: Please, no more puns, no more puns. This opened a few months after Predator, and in both reviews I make a cute little oblique reference to the classic short story, The Most Dangerous Game. Well, sue me. I blame the movies for having a limited imaginative spectrum. Also, I think this was about the last time you could use the phrase “in living color” and assume your audience took it as a reference to the Sixties slogan about color television programs rather than the Wayans brothers’ TV series (not that either would register today). All in all, this has to be counted another shrewd outing for Arnold, blending pure action with the hip irony that tries to distance itself from that action. And the casting of Richard Dawson really does make the picture—why don’t people think of stuff like that more often? As surprises go, Predator isn’t much. But the new Arnold Schwarzenegger film is still an unexpectedly gripping action movie, with no slack moments and few neat twists up its gore-splattered sleeves. It begins with one of those American special-forces units dropping into one of those unnamed Central American countries to perform a routine bit of covert rescue work. We’ve certainly seen plenty of that lately, onscreen and elsewhere. They’re a bunch of muscle-bound dudes who, when wounded, say things like, “I ain’t got time to bleed.” But Schwarzenegger and his crack team run into a new sort of enemy during their jungle mission. Somewhere out there in the trees is a thing that grabs his men and strips them of their flesh, then hangs them out like trophies on display. (This is not a movie for the squeamish.) Big Arnie and his men race through the forest to meet their helicopter pick-up, but this thing is silent, impervious to pain—and it wants to play a most dangerous game. Predator is basically Alien in the jungle, broken down into a series of stalking scenes until Schwarzenegger and the thing can go at it: Two otherworldly mounds of beef slugging it out in the primordial ooze. Under John McTiernan’s well-paced direction, this actually becomes an effective chase movie. There’s some great jungle photography by the talented Don McAlpine, who wrings all the green sweaty paranoia out of the setting; almost the entire film takes place within the choking vines and trees. Schwarzenegger indulges his penchant for James Bond-style wisecracks, which he squeezes out through the thick molasses of his accent. He implores an enemy soldier impaled on a knife to “Stick around,” and when he finally gazes upon the face of the predator, he marvels, “You’re one ugly (insert 12-letter expletive).” The audience goes nuts at that one. Good monster. At first, through some special-effects wizardry, we glimpse only a shimmering shape that seems to assume the look of the forest around it. Later the beast makes itself seen, in an outrageous design that features synthetic dreadlocks and a praying-mantis face. Inside the costume is the tall actor Kevin Peter Hall, who also plays the sasquatch in Harry and the Hendersons. I wonder if we’ll ever get to see him? Predator isn’t much of anything, but it has a punchy, ground-level force to it and a suspense ratio that holds up. 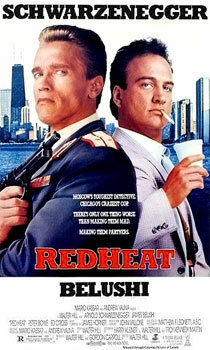 There are bad action movies and good action movies, and this is one of the good ones. It is one of the good ones. I guess I could’ve named some of the other actors in the movie, but apparently I was very taken with Don McAlpine’s cinematography, so sorry, Jesse Ventura and Carl Weathers et al. The reference to Central American adventures “onscreen and elsewhere” reminds one of how so many of the action pictures of the Eighties were in tune with the national mood during the Reagan years. It is becoming clear, seeing these reviews in a row, how constantly I bemoaned the puns and the accent. There’s more of that to come. 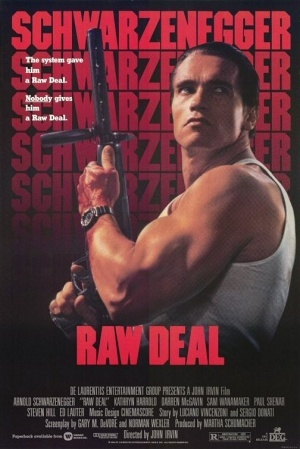 Living proof that a sense of humor can help you overcome any obstacles, Arnold Schwarzenegger rolls out his latest slugfest, Raw Deal, with tongue (as usual) in cheek. Still, lots of musclemen have tried movies; most fade fast. Schwarzenegger’s feeling for the absurd and his penchant for one-liners have kept his last couple of action flicks, The Terminator and Commando, popular with young, hip audiences. His humor is his saving grace. Let’s face it, although Arnold projects a likable personality, his acting powers are limited. That accent, which only gets thicker as his dialogue increases, is a major problem. And the name is not traditional matinee-idol stuff. None of that has stopped Big Arnie. He just grins, keeps it light, and makes sure the final reel has enough bloodshed to satisfy his millions of thirsty fans. Raw Deal hews to the formula. Schwarzenegger is an ex-FBI man, railroaded out of the Bureau some years before, now a sheriff in a small Southern town. When an old colleague (Darren McGavin) loses a son to a Chicago godfather (Sam Wanamaker), he calls on Arnold to do a little unauthorized work. Our man slicks his hair back, adopts a tree-trunk cigar, and infiltrates the family. He also meets a moll (Kathryn Harrold) whose chest rivals his own. While Raw Deal is quite well-plotted, you know that most of the plot stuff is an excuse for Arnold to get mad toward the end. Sure enough, he straps himself down with plenty of ammo, cranks up the Stones’ “Satisfaction” on his car radio, and proceeds, as one character puts it, to do 100 years of police work in one afternoon. Through it all, Schwarzenegger keeps up a stream of bon mots. Unfortunately, because the accent (they’ve stopped explaining it) is richer than a Viennese torte, many of these fall dead at his feet. But you always have the idea he’s trying. That’s not quite as facetious as it sounds; his good-natured wise-guy routine builds up strong audience loyalty. Raw Deal is not as far-out as his last couple of films, and it’s not as much fun either. Director John Irvin, a versatile fellow whose previous outing was with the highbrow pauses of Harold Pinter’s Turtle Diary, never comes close to the nihilistic glee of The Terminator. Irvin’s heart doesn’t really seem to be in the two-fisted genre. There was a funny exchange on an old “At the Movies” or “Sneak Previews” or wherever the hell Siskel & Ebert were at the time about Kathryn Harrold; Roger was singing her praises in a movie (The Sender, possibly?) and Gene finally said something like, “Oh why don’t you just ask her out?” An epic moment, and unexpectedly human, somehow. Arnold was in his career groove at this point, and everything was turning to gold. Raw Deal was just one more out of the bratwurst-grinder.